Few things can make my day, and bring me comfort, a hearty breakfast, Ice cream, but above all Nutella and Nutella bread. My mom used to get us the small individual packets of Nutella and it used to come with a cute small white spoon. Obviously one packet was never enough for me! A slice from the bread showing swirls of Nutella. Today’s bread recipe is a breakfast replacer, all you have to do is take a slice and accompany it with a glass of low fat milk, and you are ready for the day. 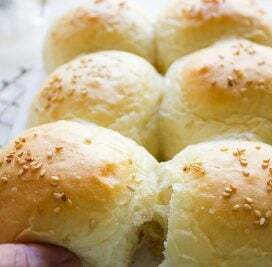 Although the bread dough has no eggs, it is fluffy and light in texture. I’ve used 1/2 cup Nutella in the filling, which to many can be too much. You can reduce the amount of Nutella of course, but if you are crazy about Nutella like me, don’t change a thing. Please read the notes at the end of the recipe for best results! Serves 7. 295 calories per serving. – Mix water, sugar and yeast, cover for 10-15 minutes. – Add oil to yeast mixture and stir. – In a bowl add flour, salt, and orange zest, mix well then add yeast mixture. – Knead for 10 minutes. Dough should be smooth and not sticky. – Cover dough with wet kitchen towel, keep in warm place to double in size, should take an hour and half. – Flour the working surface. Little amount of flour will do since this dough is forgiving and doesn’t stick much when rolling. – Roll into 9″x12″ rectangle. Spread the Nutella one inch away from the edges. – Roll tightly from the longer side, Pinch the ends and place seem side at the bottom. – Leaving one end intact cut the log down the middle with a knife. – Now you have to halves, twist them upwards for the Nutella to be seen. – Braid by twisting one-half over the other. Cover with plastic wrap and let it rest for 20 minutes. – Preheat oven to 180C/350F. – You can brush the dough with milk, or beaten egg before baking it. I didn’t. – Place parchment paper on baking sheet, transfer the braided bread on parchment paper. Bake for 15 – 20 minutes. 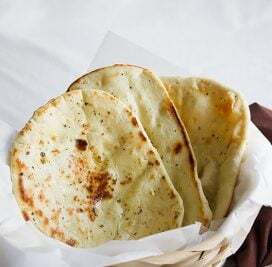 *This dough can be prepared at night. Cover and place in the fridge. Take it out 30 minutes before using. * Rolling the dough into a log can be messy, so after spreading Nutella, you can place it in the fridge until Nutella firms up a little, and then roll into a log. * The Nutella bread will not need much time in the oven, so keep an eye on it or it will over bake. *You can brush the bread with egg wash (beating and egg yolk with two-tablespoon water). I didn’t use an egg wash when I baked this bread. I could finish the whole loaf by myself..and I am not kidding about it. Totally irresistible! So I’m reading this post-lunch but I STILL just literally felt a grumble in my stomach. Damn you! This looks amazing!! This bread looks so good. 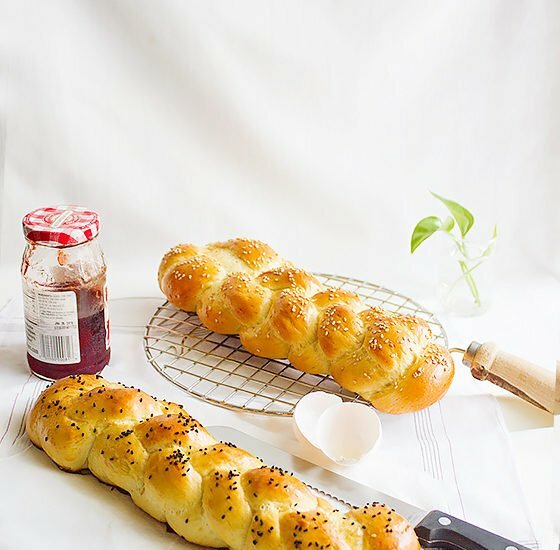 I have been wanting to try braided bread concept for sometime now and you have inspired me once again to give this a try!! I can’t get over this recipe. I came straight over form Instragram! You are a LEGEND. Full stop, hands down. This recipe needs to go viral! 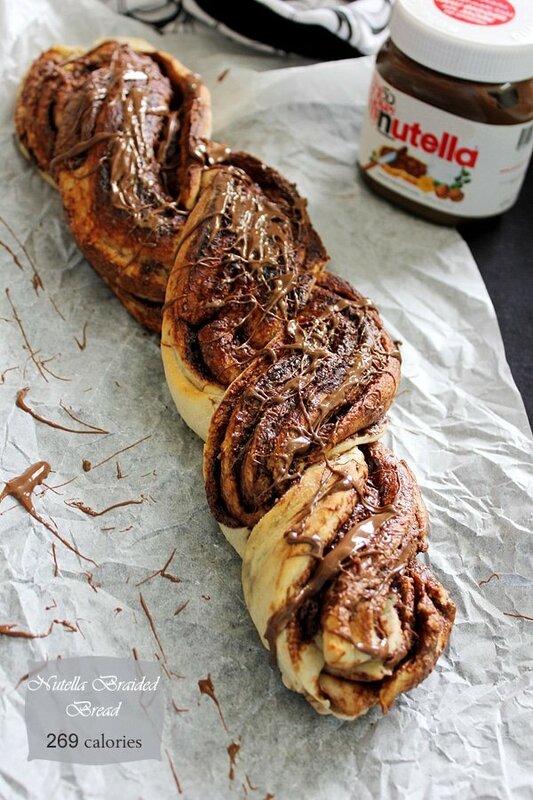 Wow – what a gorgeous bread – all that Nutella is making me drool!! 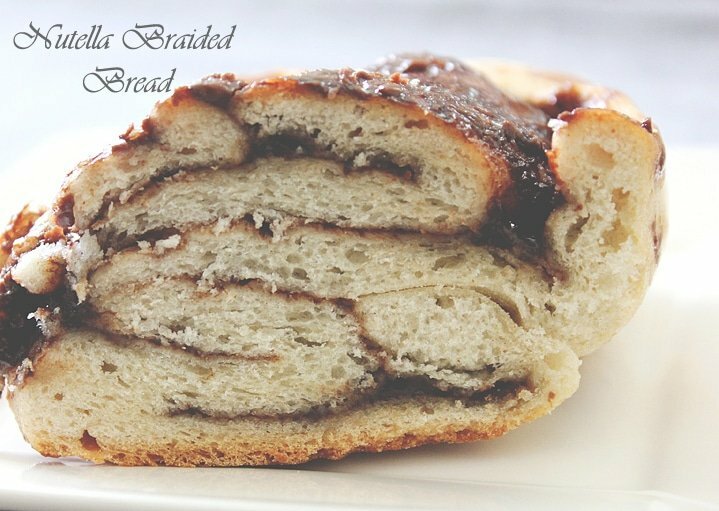 I definitely not a sweet tooth person, but this butella recipe stolen my hearth…. Wow, so pretty and it sounds amazing! Love the braid. What a beauty! Very delicious beauty! Nutella!!! YUM. 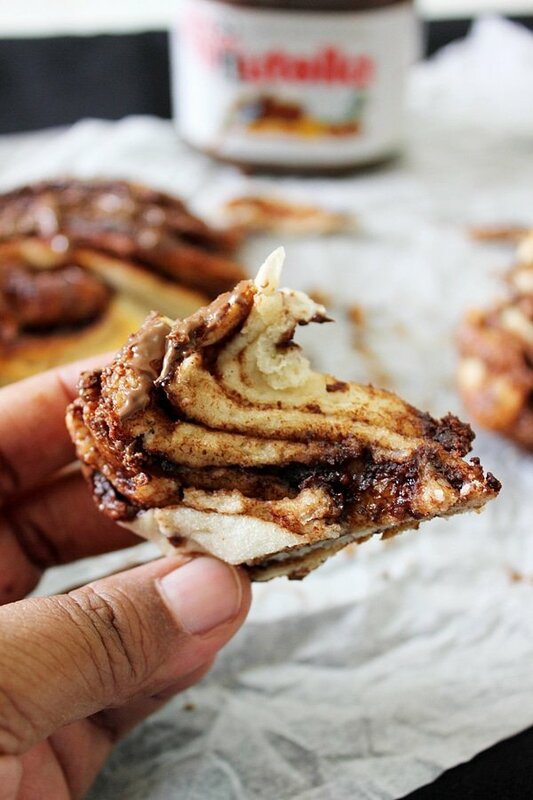 I love the layers of nutella inside… so gorgeous! 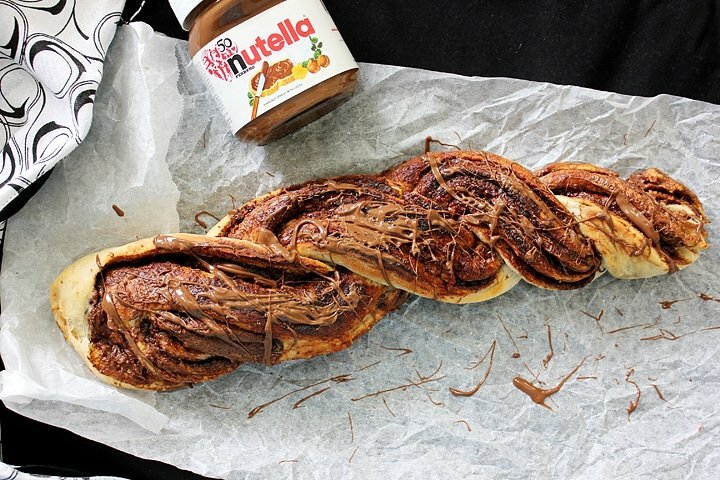 This nutella bread looks so incredibly delicious! 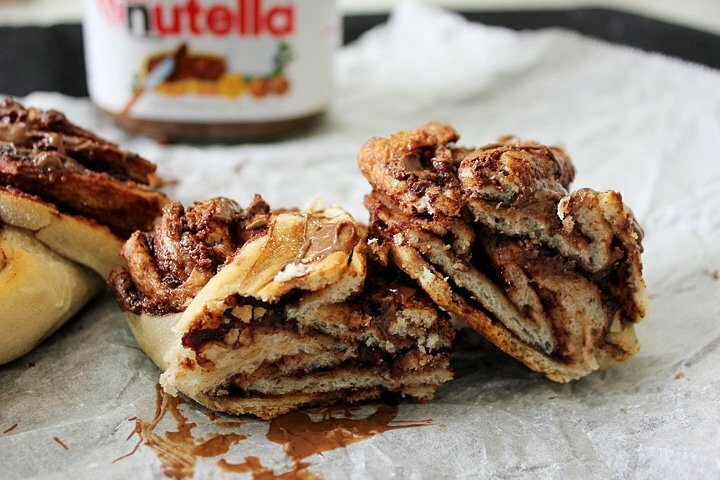 I love anything nutella related so I definitely need to recreate the recipe!